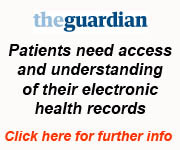 Advice on what to do if you discover errors in your GP record? People generally believe their GP health record will be perfect and error-free. Whilst GPs and primary care staff will always try to ensure accurate record keeping, a variety of surveys have shown that up to 30% of records may contain at least one error. This may come as a surprise to many people and some may think this means records are not safe to use. The errors that surveys have highlighted have generally been something small and of little consequence such as a spelling mistake, a date that is slightly out or a minor detail that is unlikely to cause any harm. However, errors can sometimes be serious and of course the important question is not why there is an error but rather what can be done to correct it? So in response to requests from patients, we have put together some guidance on what to do if an error is found or suspected. You may think this is impossible given that you cannot "stop" an error from occurring. However increasingly many clinicians are positioning the screen they use during the consultation so that you can see it too. They do this so that it is easier to share information with you during the consultation. But this can prevent a variety of simple errors eg if the incorrect record has been opened. You can check for spelling errors and also ensure facts are correct eg right leg instead of left leg etc. This is also your chance to ensure the important and essential facts have been captured. But remember, sometimes your doctor or nurse treating you may prefer to write after you have left the consulting room or may add to the record things they may have forgotten or needed to check first. Timing of error. Some errors are identified immediately and so long as you can contact the named clinician and he or she agrees that an error has happened in the record, they can usually change it. The longer you leave it until identifying the error, the more difficult it may be to change it. This is because it is a medico-legal document that may have implications if others have acted on (or relied upon) the information recorded; at another time. However, the general principle should be to ensure the record is correct and if it is agreed that there is in fact an error then every effort should be taken to fix it. If there is a reason why this cannot immediately happen then your clinician should explain why this is the case. The best course of action is to contact the practice as soon as an error is identified to help prevent problems occurring or worsening later. Who has made the error? If you can speak directly to the clinician who has made the error then they can correct the error themselves. This becomes more difficult if you are unable to contact the clinician because he or she is no longer there. We will try to contact the clinician if they have left the practice. However if the clinician is no longer contactable or in fact has died then it can become very difficult to change the record unless it is clear that the error is factually incorrect. The medical opinions recorded by those who have since passed away are notoriously difficult to change. Thankfully this is a rare phenomenon but can cause a great deal of distress for those concerned. Incorrect addition to the record. This can often be the most distressing as the information has been accidentally added to the record without you even knowing about it. Such errors can remain in your record for many years before it comes to light. The defence you have against this is to regularly check your record to ensure there have been no additions to your record without good reason. Please note though that as a practice we regularly review records for certain key facts and may add to your records or comments without necessarily informing you. For example you may have had a lipid profile blood test - we may add our understanding of the result prior to contacting you to discuss it further. Missing information in the record. Sometimes errors creep into your record as a result of important information that is missing eg known drug allergies. The main way to defend again this problem is to regularly review your records to ensure such missing information is identified and then contact the surgery to speak to the doctor. They will usually help you to fix the problem. Information incorrect from another source eg local hospital, the Out of Hours provider GoToDoc or another community based health service. Important: Whenever you have any healthcare delivered by another group outside the surgery and find an error then please contact them directly. They will have an agreed policy on how to deal with such an eventuality and what to do next. It is important for them to know about the error so that it can be corrected. What about abbreviations in records? Abbreviation are not errors in the record although we try very hard not to use them. You can see a list of the abbreviations some of us use when writing in the notes. If you come across an abbreviation and want to know what it means, click here and learn what this means. This guidance has been produced for you as a result of patients asking about how to fix errors in the records. Get access to your records so that you can regularly check the accuracy of the record. This is particularly important after you have had an encounter with a health professional either in the surgery or outside it too. View your record and if possible see what the clinician is writing in your record during the consultation. If you find someting which you feel might be an error then contact the surgery and ask to speak to the clinician who you believe has made an error in your record as soon as possible. Ideally, it is best if you can write down the error you have found and write to the surgery to inform us as such. If it is an error like a date that is incorrect then you may be able to point this out over the phone without needing to come in. However if the nature of the problem is more extensive or complicated then you may be better off writing to the surgery, explaining the nature of the problem and then using either the clinician or the practice manager to respond. Please note - none of the staff in the surgery plan to make errors in your record. We try very hard to prevent errors from occurring but with the best will in the world, errors sometime do happen. We hope this guidance goes in some way to help describe what we do about errors and how you can help to try to minimise the risks and ensure you continue to enjoy a high quality and safety. If you have any further questions then please contact the surgery, the clinician who was dealing with your care, the practice manager and we will endeavour to try to contact you.